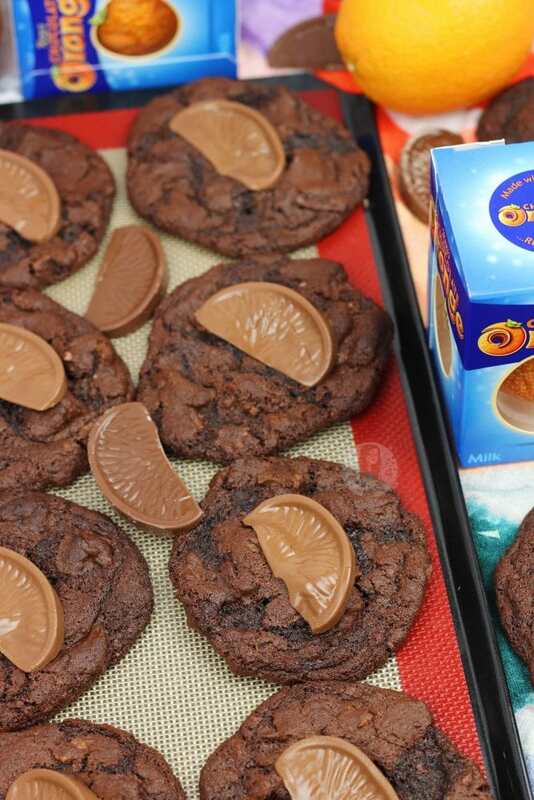 Delicious Moist & Crunchy Cookies full to the brim with chunks of Terry’s Chocolate Orange – heavenly Terry’s Chocolate Orange Cookies! I have ALWAYS adored Chocolate + Orange flavouring together – especially Terry’s Chocolate Orange – it sounds like an odd combination at first if you haven’t tried it, but once you have, you will never forget it! Literally my favourite chocolate! When I was little, I would eat at least 3 a week (I realise this is bad, but I ate plenty of healthy stuff too!!). 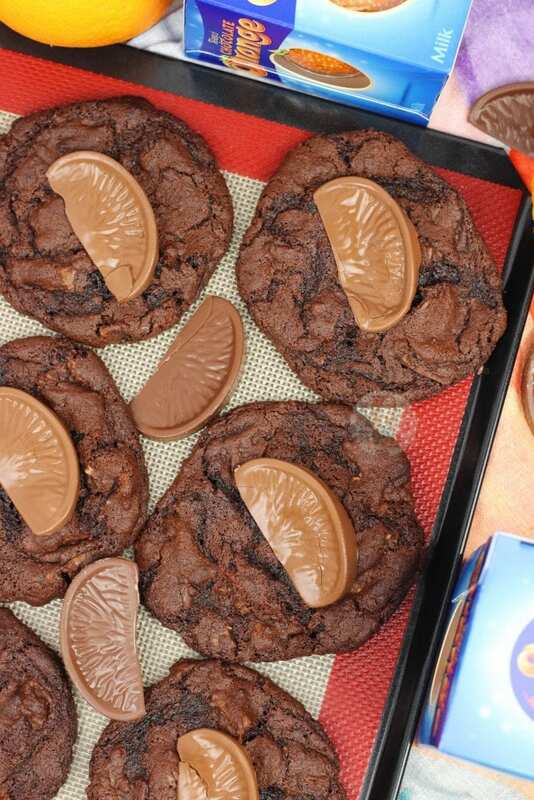 I have always baked big cakes and used chocolate orange, and then cupcakes as well – but when I went to the supermarket with my boyfriend recently and he picked up a bag of Terry’s Chocolate Orange Cookies to buy, I realised I might as well bake them at home myself so I know exactly what is in then, and sometimes it works out much cheaper! 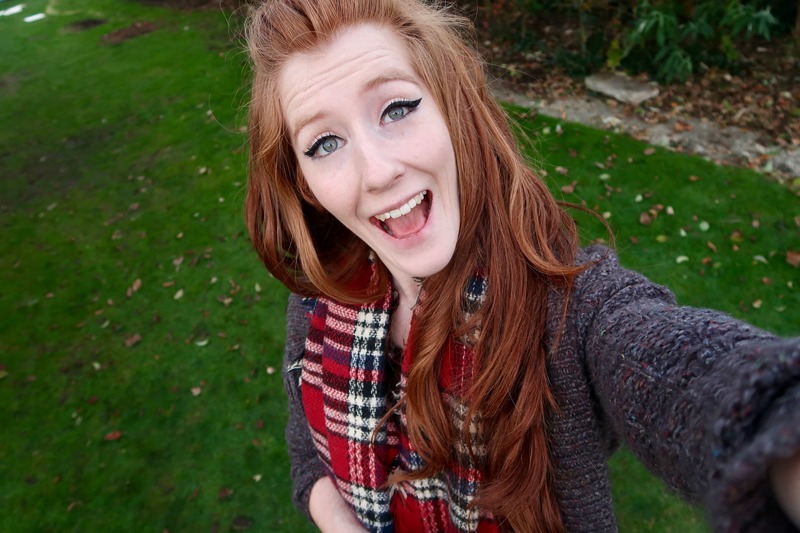 – Turn out this is the best decision I have ever made. Seriously though, I know you all love and adore Terry’s Chocolate Orange – hence the love for the No-Bake Chocolate Orange Cheesecake that I posted a few months ago – my second most popular recipe on my blog! 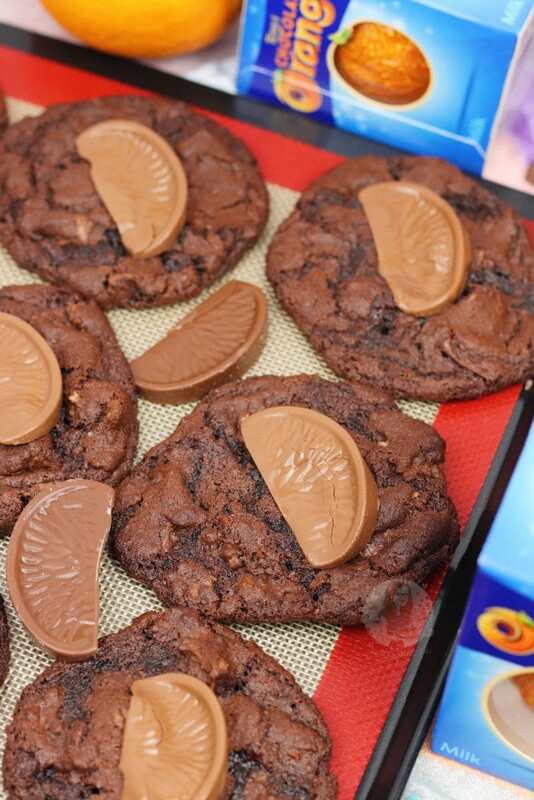 These cookies are the perfect combination of crunchy edges and gooey delicious centre – its a winner all round! These cookies are always perfect to bake around Christmas time, or when you are just craving something utterly delicious. 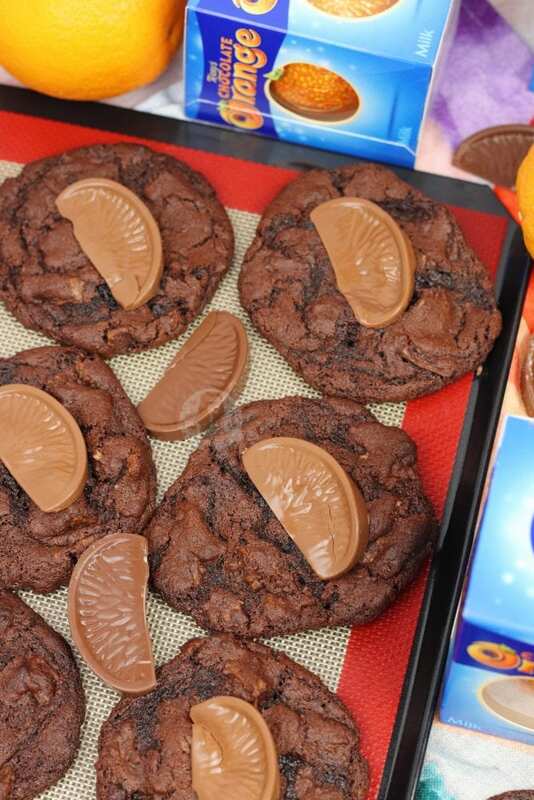 The perfect part about them is that the oils in the Chocolate Orange that create the flavouring, makes the cookie bake perfectly every single time – I have honestly never had a problem with these! Enjoy! These are the sort of cookies that you will want to bake over and over, partly because they’re just so damn easy to bake. Honestly, cream the butter and sugars, whack in the egg, whack in the dry ingredients, shove in all the chocolate orange ever, and bake. Most other recipes I’ve seen require chilling first, and these beauties don’t need it. Not needing chilling means you can get to my favourite cookies ever, quicker. Honestly, these are genuinely my favourite cookie recipe I have, partly because of the Terry’s Chocolate Orange obsession I have going on, but that’s not entirely it. I genuinely just think the actual cookie is insane! It’s such a wonderful mix of chewy, gooey, and delicious. If you bake it for longer, it’ll get crunchy too! This recipe has been on my blog for quuuuite a while now, and as I write this after updating the images in November 2018, it remains to be my favourite cookie. I know the recipe off by heart and have experimented with it a few times, resulting in recipes such as my Toblerone Cookies, and my M&M Cookies. I’ve also created a Cookie Bar version of these because I just adore them THAT much. 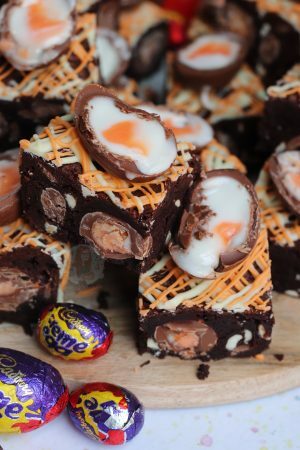 Honestly, imagine baking these, and serving them with a scoop of my Terry’s Chocolate Orange Ice Cream, or having a Terry’s themed party and devouring these and my other 15 themed recipes as well. Maybe I love it too much, but honestly, if you try these you will understand my pure and utter love. Enjoy the recipe! 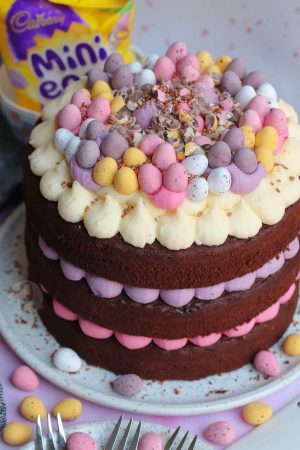 Mix together the butter and sugars until light and fluffy and thoroughly combined – I often use an electric mixer for this bit as it makes it so much easier and combines the ingredients very well – but good ol’ manpower will work too! Add the vanilla essence and the beaten egg, and mix again briefly. Spoon the mixture onto the trays and make sure they are suitable spread out so they stay separate! (I usually fit 6 on each tray to be safe) I also use a cookie dropper/ice cream scoop to make them identical sizes. Bake in the oven for 10 minutes – remove quickly and add a segment to each cookie, and then bake for another 1-2 minutes. 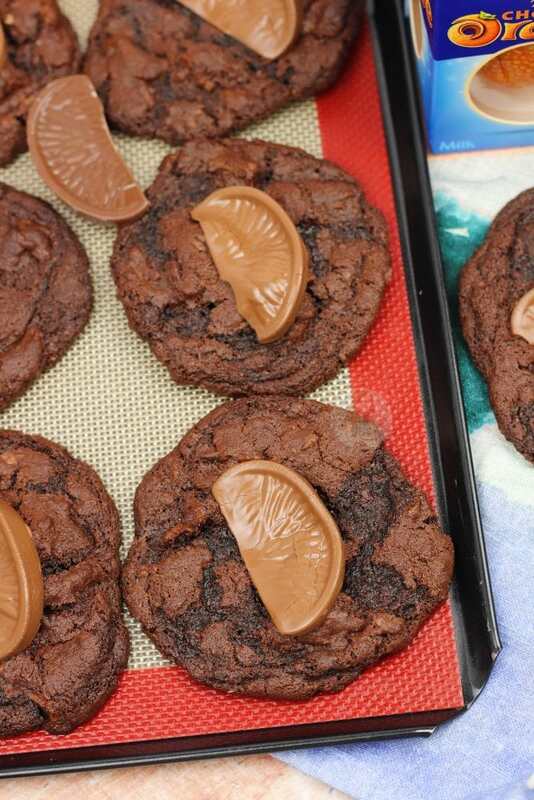 You don’t have to add the chocolate pieces on top, you can include it all in the dough, but I love having melted bits of chocolate on top of a cookie – especially if I am serving them warm with a drink, such a gooey chocolate treat! 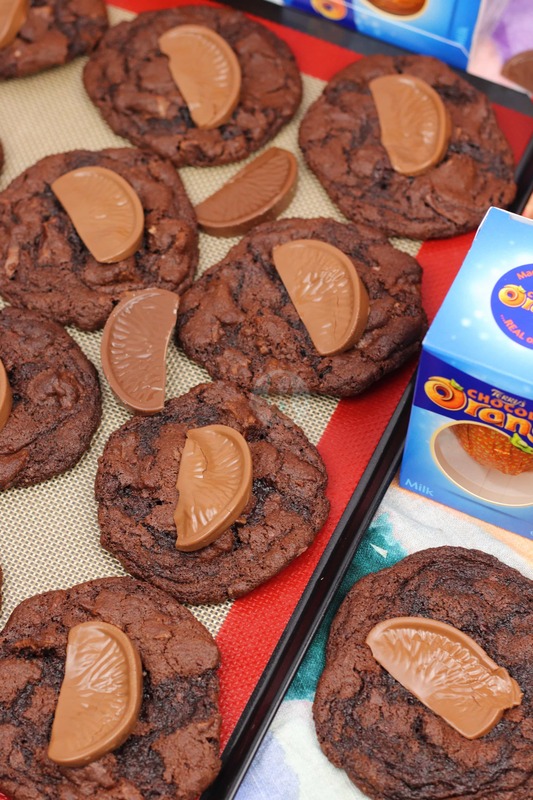 If you don’t have Terry’s chocolate orange where you are, you could try using milk chocolate with a bit more orange zest, or even a bit of orange flavouring which I often do! These cookies will last for 4-5 days+, but usually, get eaten before that. Older Next post: Classic Buttery Scones! Newer Previous post: Granary Bread! hi there, your cookies are beautiful. I just made these…..tried to convert to US measurements. Mine came out puffy and very dark chocolate color. they dont look anything like yours? help? Hiya – if you are in America some of the ingredients would be different which would be the cause. These were a real hit with my work colleagues. I quartered the orange for the topping to give more of that gooey chocolate hit! Have wondered about using the mini segments with the exploding candy, but not sure how that will bake? 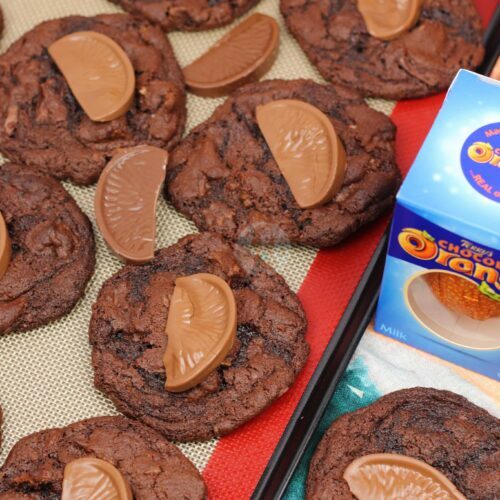 Will definitely be making these again, you can’t beat the chocolate orange combination. Just made a batch of these cookies. Really pleased with how they’ve turned out and they taste so good! I’m unsure what you mean as to ‘make it as cookie dough’? Do you mean eat it raw? I wouldn’t recommend that. Made these today. My husband and son love them (me too), I took some to work to say thank you for some favours and everyone loved them. Make exactly as the recipe says, it’s perfect. Thank you. 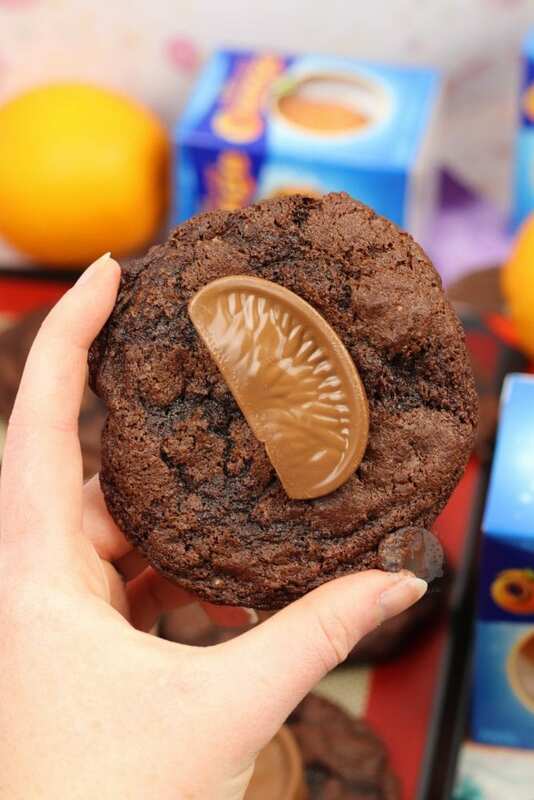 Do you use the Terrys chocolate orange minis or actual chocolate orange in your cookies? Whichever I have, they both work perfectly! I wanna make these cookies but my kids have werid allergies to cocoa powder so can I just take that out? And will it mean I will end up with a normal beige colour dough? P.S I LOVE UR RECIPES! Oh okay thanks Jane I will let u know how it goes! 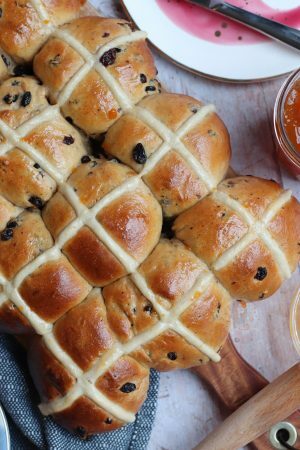 Would this recipe work using margarine (stork) instead of butter? 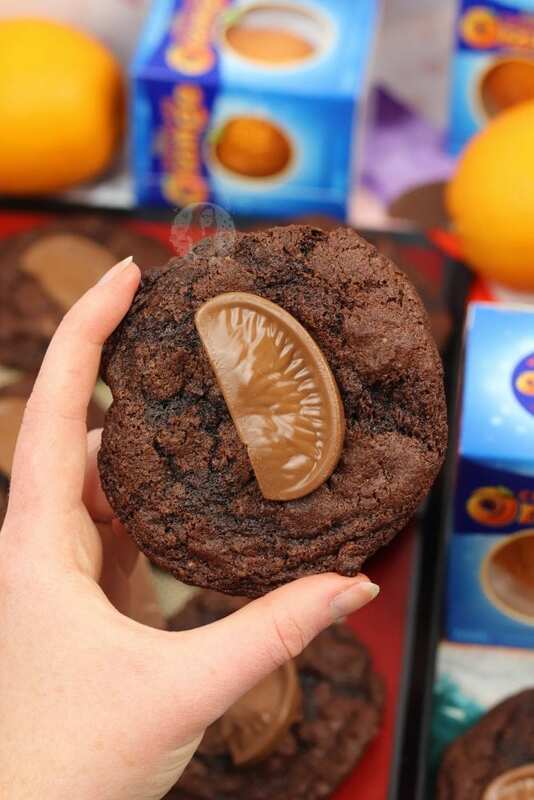 Chocolate orange is the best combination! Thank you for this recipe. I am hopeless at baking but these turned out absolutley amazing! Most delicious cookies I have ever had. Thank you. I think mine is a 5cm ? Yes! Baked or raw the mixture can be frozen. These were out of this world amazing!! I made 15 cookies in total and they were all gone within 2 hours of being out of the oven!!!!! Will make a double batch next time! Thank you Jane for sharing this recipe I made these today turned out nice ?. Hopefully my hubster will love these cause he loves chocolate orange’s ?? Haha thanks! He’s very similar to me then, I love them! Pingback: BLOGMAS #13: Christmas Treats. Milk chocolate or dark chocolate orange? Whoa!! Seriously? These will be my favorite cookies from now on!! it is genuinely my favourite and most consistent recipe Ive ever made!! 🙂 Thank you! These look so good! We love those chocolate oranges! Thank you!! They’re so tasty aren’t they! I love the chocolate oranges, and your cookies look delicious. These look amazing. Thanks for stopping by my blog. I am glad you did since now I have found yours! Looking forward to looking at your other recipes too. Thank you!! And yeah I guess that would work, definitely try it if that’s what you usually do when you substitute it? And thank you!! These sound delicious, omg yes! 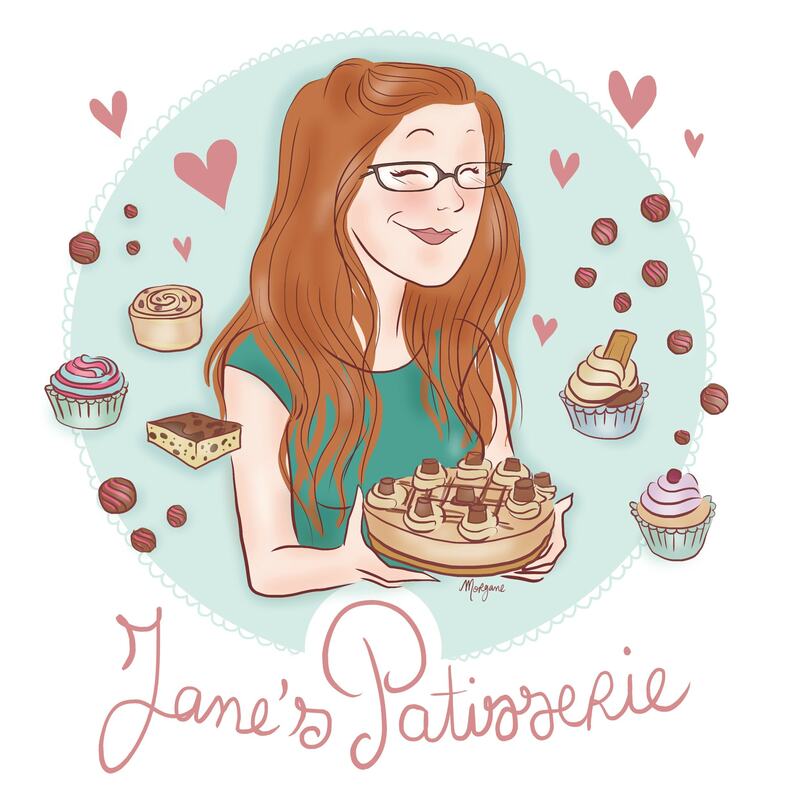 …but all I can say in the negative is that 12 cookies is DEFINITELY not gonna be enough for me…so it’s Recipe multiplier time!! Haha thank you!! I tend to make double batches on all cookies I make!! These look and sound so delicious! Chocolate oranges are the best. Love the look of these, On my list of things to try!!! Thank you so much!! And I hope you like the recipe!! Chocolate and orange just work and play nice together despite it seeming totally illogical for it to be so! They really do!! I always think the orange will make the chocolae split but they are a marriage made in heaven! These literally made me go “oooooo”, definitely going to have to check this recipe out. 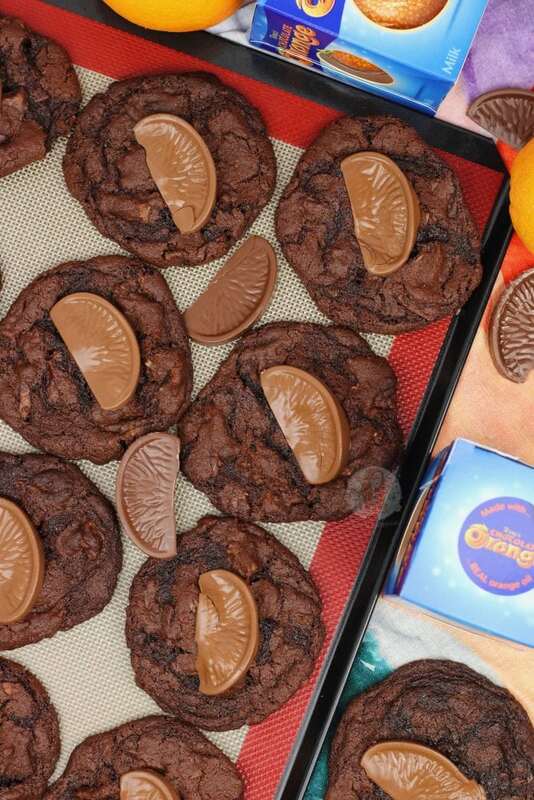 Love cookies, love chocolate orange – what’s better than combining the two? !